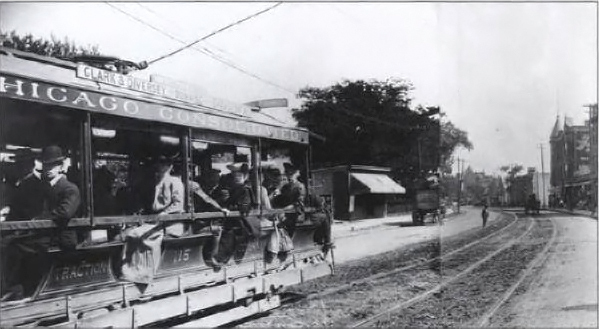 June 27, 1899 – The Lincoln Park Commissioners sign an agreement with the N. P. Glann Construction Company to complete the paving of Diversey Boulevard form Clark Street to the North Branch of the Chicago River. This will be the last link in the chain of boulevards that connect Lincoln Park with the West Side park system. It has taken three years to get final approval for the project with the work twice being put out to bid with all of the bids subsequently rejected because, according to a park commissioner, “the lowest was too high.” [Chicago Daily Tribune, June 28, 1899] The board will follow the wishes of the property owners on Diversey in determining whether crushed cobblestone or crushed granite will be used as the roadbed. The above photo shows the intersection of Diversey Parkway, Broadway and Clark Street just about this time. June 27, 1965 – Ira Bach, the Chicago Plan Commissioner, predicts that the Chicago River in the downtown area will be transformed into “one of the world’s most beautiful waterways in the next 10 years.” [Chicago Tribune, June 28, 1965] He only missed the mark by forty years. “The new Pioneer Court dedicated . . . by the Equitable Life Assurance Society of the United States and the Tribune company, is the latest exquisite example of how the river bank can be beautified by an unusual development,” Bach said. 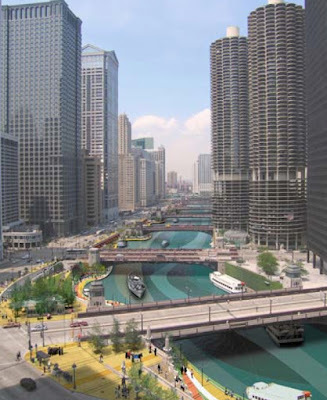 “With other major riverbank construction programs on the planning boards, other plazas and landscaped open spaces can be expected to be created along the river in the next decade.” This month Bach’s prediction proved, for the most part, to have come true as the 100 million dollar Riverwalk has opened the entire south side of the river from Lake Michigan to Lake Street.